Fairy-tale land has gone wrong! We have just received a letter telling us that we are needed to help restore fairy-tale land. All of the stories are going wrong and none of the characters from within them know what to do. Luckily, we know who can help. The wizard! We must travel to Castle Wiz in order to inform the wizard and ask for his help to make all of the stories go right again. We wrote descriptions of the wizard's castle to help the fairy-tale characters find it. As we embark on our journey, we meet a young girl looking really confused. We decide to go over and speak to her to see if she is ok. We realise it is Little Red Riding Hood! She explains to us that in her story the wolf hasn’t followed her to Grandma’s house like she was expecting! She doesn’t know how to make the story go right anymore and is worried people won’t want to read it if nothing happens! We tell her not to worry as we are on our way to the Castle in order to ask the Wizard to help restore her fairy-tale. We invite her to come along so she can tell the Wizard what has happened. As we carry on our journey, we see a beautiful looking girl wearing a ball gown…but she hasn’t got any shoes on! She comes over to speak to us and we realise it is Cinderella! She too explains to us that within her fairy-tale, things haven’t gone right. When Prince Charming came to return her glass slipper, it didn’t fit like it should have done! Poor Cinderella didn’t know how she could make this story right! We explain to her not to worry because her story isn’t the only one that has gone wrong! We invite her to come with us to the Wizard in order to see if he could help us. Further along the path we see three pigs looking very out of breath. They tell us that they have just had to run away from the wolf as he has managed to blow down their brick house, which wasn’t supposed to happen! We reassure the pigs and tell them not to worry as we are on our way to see the Wizard in order to ask him to make the fairy-tales go back to normal. The pigs decide that they will go with them to see if the Wizard can help. Through the forest we hear a lot of shouting. We meet Snow White as she is out looking for her dwarfs as they have gone missing! 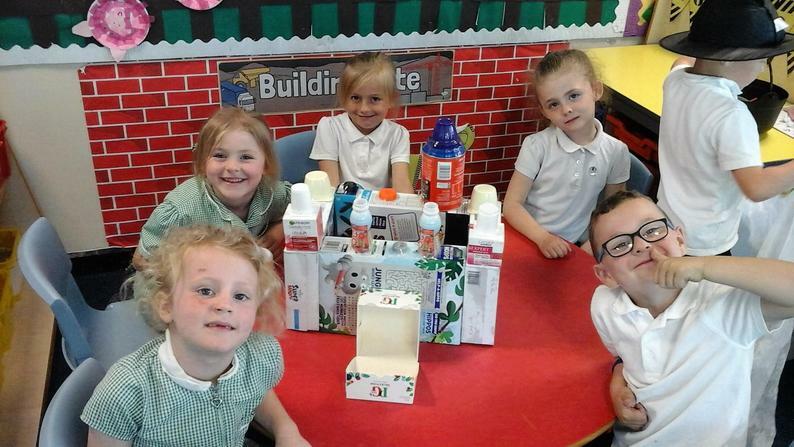 She tells us that when she woke up this morning, they had all vanished! Poor Snow White didn’t know what to do! Again we explain that we were going to the Wizard to see if he could help us and therefore invited her to come with us. We created our own eighth dwarf with their own personality. We had swimmers, readers, dancers and sporty dwarfs. As we approach the castle, we can hear lots of shouting for help coming from inside a small cottage in amongst the trees. We rush inside and find both Hansel and Gretel locked inside the cage by the witch. Gretel hasn’t been able to lock the witch inside the oven and therefore no-one is there to free poor Hansel! We quickly rescue them both, telling them to come with us so that we can get the Wizard to help us! We finally arrive at the Castle and tell the Wizard everything that has been happening down in fairy-tale land. He uses his magic key to rewind the clock, allowing the stories to start again, hoping this time they will be told correctly! 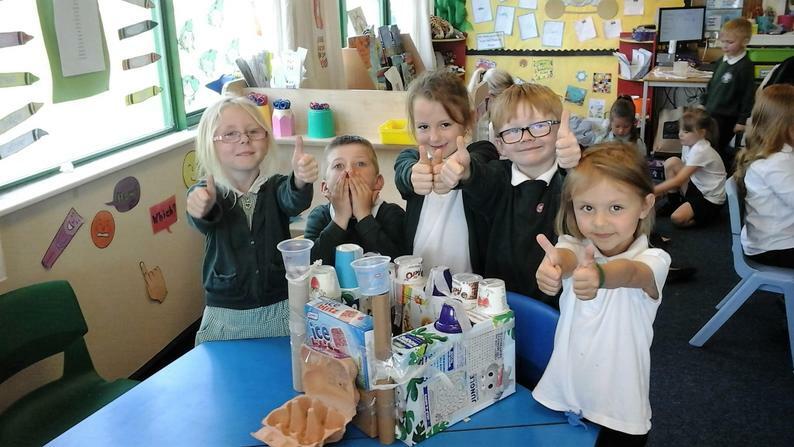 We made castles out of junk modelling. We thought about the different parts we had learnt. 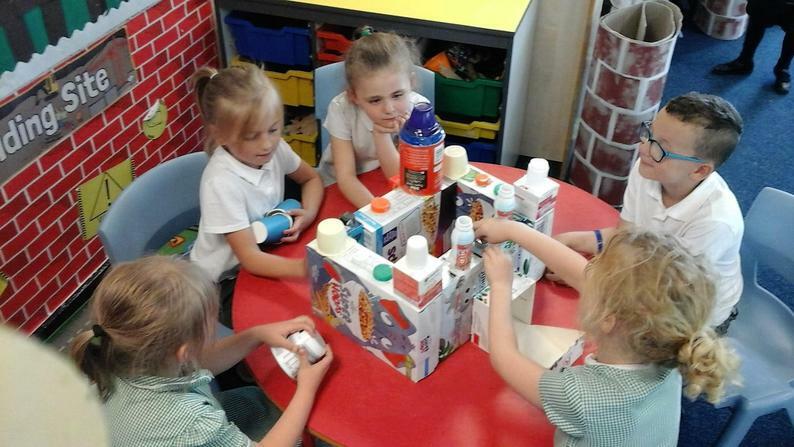 We used bottle top and yoghurt pots for battlement, egg boxes for drawbridges and Oreo boxes for towers.